The Arabian and the Morgan. Can a Morab really be considered a breed? Isn't it just a cross between two breeds of horses? The combination of the two has brought about a horse with all the good traits of each breed. The breeding of the Morab-horse is genetically complimentary and gives the resulting Morab enhanced beauty and strength. The Morab is not just a nice, crossbred horse. Breeders can, with incredible accuracy, predict what second-and-third generation foals will look like, and what traits they are likely to inherit. The well bred Morab-horse has a consistently uniform look, 2nd, 3d, 4th and 5th generations show little difference if any changes from first generation Morabs. It is this ability of the Morab to transmit their distinguishing characteristics to their offspring that make the Morab a distinct breed. is an ancient desert horse of the Bedouins. It was bred for beauty, stamina, soundness, speed, and disposition. Called the Drinker of Winds, the Arabian has powerful lungs and endurance. 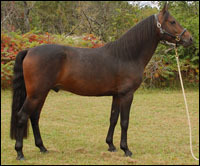 a uniquely American breed came about in the 1700s, and also has Arabian blood along with other genetic formula that resulted in the legendary stallion, Justin Morgan. The ruggedness and harsh climate of Vermont enhanced the qualities of the Morgan. This horse has incredible strength, speed and endurance, as well as a friendly, willing disposition. Combine the traits of these two horses and you get as horses with the broad, powerful chest and naturally superior breathing system. Morab-horses possess a shorter back than other breeds, one backbone less as does the Arabian. This shorter back, combined with the longer croup of the Morgan, endows the Morab with great strength and smooth gait. This enables Morabs to excel in competitive and endurance riding. Its powerful hind quarters, make it a natural athlete and suited for the high performance demands of Dressage, and jumping. The Morgan contributes the wonderful formation of bone with medium length pasternsThe Arabian: broad hard hoof and lower heel and almost non-existent hoof and leg problems. Many are never shod and require minimum hoof trimming. The average Morab horse today ranges from 14.1 to 15.2 hands and can be found in a variety of colors and markings common to the Morgan and Arabian. The weight is between 950 lbs. to 1200 lbs.Muscular yet refined. It is an elegant and powerful horse. Smooth, stylish with a thick luxuriant tail and mane. It is dependable, affectionate and highly intelligent. The Morab horse cant be beat in temperament and willing attitude. Not only is he beautiful in the ring but is comfortable switching form the show ring to a working horse or on trail.Due to his willing, calm and loving disposition, it is also an easy horse to train and handle. People who own Morabs treasure their horses and usually keep them for life. Move From The Morab Horse Back To Horse Breeds.